Hasegawa Chikaranosuke Eishin (Shigenobu). Considered the central figure in the development of the Muso Jikiden Eishin-ryu. 1983 – Kim Taylor does iaido for the first time with Mitsuzuki Takeshi in Amherst, MA at an Aikido camp. 1987 – Kim starts teaching Bruce Morito a little bit, Bruce finds Ohmi sensei in Toronto. Ohmi sensei is reluctant to teach us but by persistance we succeed. 1989 – Bill Mears made first ‘contact’ with Haruna sensei at Kenseikai seminar in Dartford England (Haruna, Oshita & Komaki). He was by himself and met Trevor Jones for the first time. Through Fujii sensei he asked Haruna sensei if he would come to Canada but he was VERY cagey (Fujii said Haruna didn’t know anyone but me and so was cautious). Bill received his Shodan. 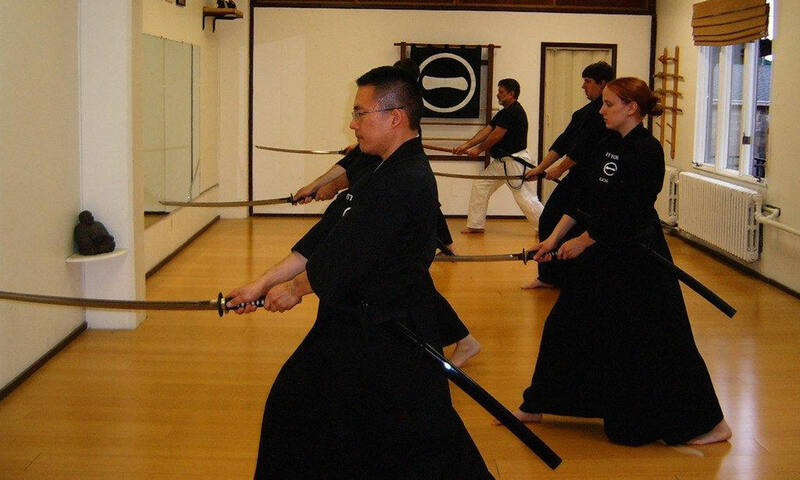 Bill had joined the CKF previously as guest Iaido instructor at the Hamilton Kendo Club possibly making him the first non-kendoka in the Canadian Kendo Federation (CKF). 1990 – Bill returned to England for vacation and Kenseikai seminar (Haruna, Mano, Oshita & Komaki). Ohmi sensei flew over for his first ever trip to England (sponsored by Seidokai). Bill met him at the airport and took him up to seminar and there he met Haruna sensei. This was the start to bringing Haruna sensei to Canada (in 1991). Ohmi sensei was a huge success as guest translator! Ohmi sensei got Godan Bill got Nidan in London. This was the year that Doug Blue travelled to Canada searching for an Iaido instructor and met Ohmi sensei. 1991 – Bill challenged & passed Sandan in Toronto under IKF/ BKA rules. The following January it was taken away by CKF and then reinstated the next December!! Around this time, Doug met Bill Mears who became his mentor and eventually a mentor to all of us in the Ittokai who were fortunate enough to know him. 1995-1996 – The Ittokai was formed. The first 7 members were Doug Blue, Clint Cross, Jim Robeson, Bob Anselm, Tim Smock, Mario DiGiambattista, and Jeremy Wyatt. 1998 – Clint Cross, Jim Robeson, and Jeremy Wyatt received Shodan in December. 2002 – Haruna sensei passed away in the early hours of Saturday September 14th. This was a great loss to all of us. 2005 – Bill Mears passed away on the morning of June 20th. We miss you Bill. 2005 – Clint received his Nidan ranking in December. 2007 – Clint received his Sandan ranking in December. 2008 – Tak Furuta and Kevin Thibedeau received Shodan in May.